It’s time to set sail once more with that confectionary plantation owner Sir O. Yuri Wiseguy-eh and his crew from Gum Drop Island. Thrust upon an adventurous journey into parts unknown, they meet new, and not very friendly…okay, they’re some downright ornery— characters. Their mission —which they accepted with many a hesitation— includes a hair-tingling encounter with a family of widowed spider sisters, a dispute with the furious mob of ugly Babes, and a creepy, chilly, evil laughing confrontation with the one-and-only I.B. Nosey seeking mad scientist Dr. Ag O. Nee. (Whew. That sentence is a mouthful, dear readers!) And will our heroes discover what they seek? Will they save the day? Will anyone care? Don’t you think it might be kinda fun to join us on this venture and find out? A fantastic sequel to Ahoy, Gum Drop. Miss Mae has once again filled her story with a super, imaginative adventure and lots of humour. The gang have a new mission, to save Silliness and Imagination who are being held captive by the Techno Monster. Once they embark on their journey they meet an array of unusual characters who also need help with various problems. The book is fast paced with every page packed with action so I loved that there was a little recap at the beginning of each chapter. For a child listening to a chapter each night, the recap is a nice touch. 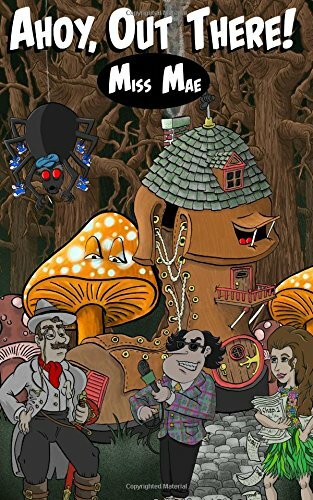 I was thoroughly entertained and amused by this light hearted tale and I would highly recommend it to anyone, young or old, who are looking for humour in their next read. The audio version is currently in production.